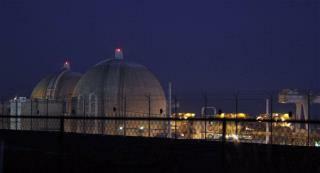 (Newser) – The San Onofre nuclear plant north of San Diego was closed last evening to deal with a radiation leak that regulators say posed no danger to the public or to plant workers. The plant's operators say a small quantity of radioactive gas escaped from a leaky tube in a steam generator, the Los Angeles Times reports. Just send in Mitt Romney. He'll close it down for ya. Wait til a huge quake hits SoCal. It will. And this place will be worse than Fukushima. How many millions of people live with 100 miles of this timebomb? It is a big number. If I saw any evidence that the regulators viewed their role as protecting the public or to plant workers, I would be a bit less concerned.